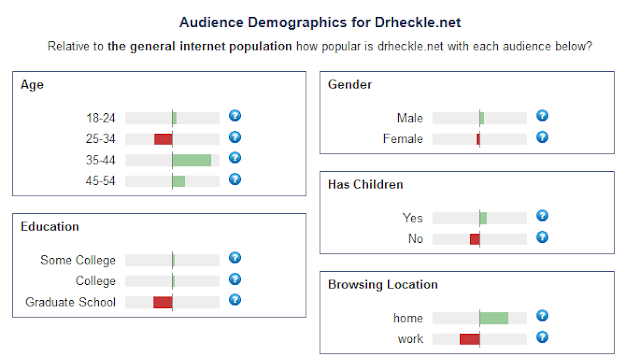 Advertise with the Dr. Heckle network today! Dr. Heckle gets over 100,000 hits per month and over 3,000 hits daily! FREE Facebook & Twitter promotion, FREE inclusion in all Dr. Heckle outgoing correspondence to mailing list & promotions, linked to all social media sources. Over 50% of site visitors are from the US, with a substantial following in the UK! My top 2 age demographics are males 18-24 and females 35-44. 54% of traffic is from returning viewers, 46% is from search engines. So I have a lot of regular users and am generating a lot of new organic traffic from content on my site. Google ranks my content very high. Contact me today to get your promotion started!